January 27, 2019 By Steve Moses & filed under All Articles, Other Tactics & Training, Tactics/Training. “If some skeevy guy attacks me with a knife, I will simply draw my pistol and shoot him.” Good luck with that, unless said knife-wielding miscreant is well beyond contact distance, intoxicated, stupid, or just wants to die (“suicide by cop”). Most assaults involving edged weapons are initiated at distressingly close distances. Almost everyone else most likely wants to threaten, injure, or kill us without getting injured or killed themselves, and in order to do that, they must get close enough to launch their assault with a high probability of success. The closer they are to the target when their intent is revealed and action initiated, the less time the target has to effectively respond. The probable intent behind the famous Dennis Tueller Drill, which has been widely misinterpreted as a means of establishing the acceptable distance a knife-wielding attacker can be shot and a valid self-defense claim be successfully asserted, was to shed light on the fact that a youthful assailant can cover about 21 feet in approximately 1½ seconds. In other words, we have less than two seconds from the onset of an attack in which a knife is used to observe, orient, decide what to do, and then act if the assault was launched from a distance greater than the length of the average automobile. Typical handgun rounds do not do a particularly good job of stopping people in mid-stride unless they make the conscious decision to stop. My good friend and mentor Tom Givens has maintained a fascinating database of the shootings in which his students have been involved. After reviewing over 60 such incidents, he found the most likely distance at which gunfights occurred to be somewhere between nine and 15 feet. Again, the weapons used in these occurrences were handguns designed for use at well beyond contact distance. It should come as no surprise that a knife attack may be launched at distances as close as arm’s length. The distances at which knives are deployed with murderous intent by sociopathic persons may prevent us from bringing a pistol to bear quickly enough to stop the criminal action, plus the very action of attempting to access the pistol may increase the amount of physical damage we sustain. Establishing a good firing grip on the handgun and clearing leather (sounds better than clearing Kydex) just about the time a four-inch blade is plunged to the hilt in my torso or neck is not my idea of a successful defense. Spend an hour or so perusing the Internet and check out the videos showing actual edged-weapon attacks. We now know that a real-world knife attack looks nothing like what we typically see on television and in the movies. Think direct, savage linear attack where the attacker applies crushing pressure; often uses the non-weapon-bearing hand to seize the target’s clothing, hair, or neck to impede escape; and the knife or improvised weapon is employed in multiple low-line thrusts to the body or high-line thrusts to the neck and face. Of course, the best defense to a knife attack is successful deterrence and disengagement. This is probably not going to be an option if you are in the presence of family members (especially children or mobility-challenged adults), trapped in a corner where the only viable exit is through the attacker, and last but far from least, suddenly blindsided or ambushed and you have no time to do anything but go hands-on. Red Zone Threat Management founder and head instructor Jerry Wetzel. 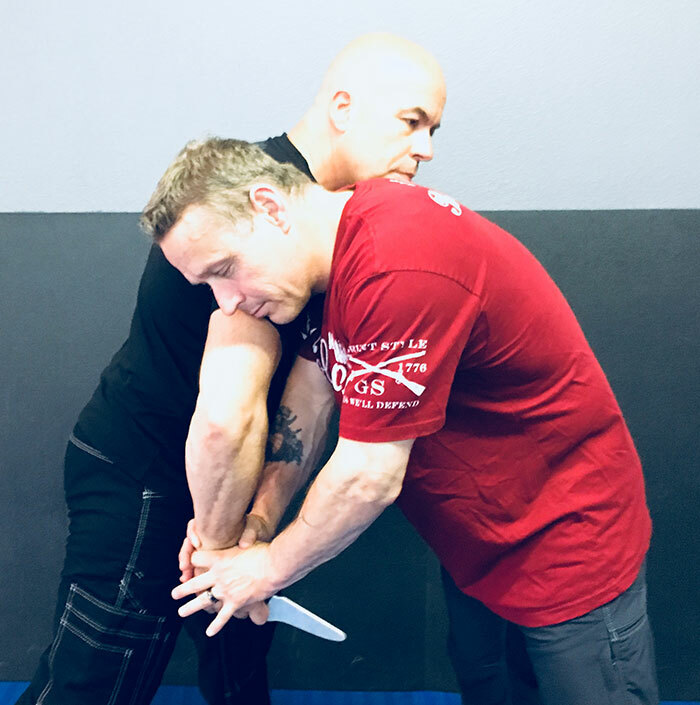 Having seen the flaws in virtually every empty-hand knife defense system I had reviewed, I did what I do best: I sought instruction from an individual held in high regard by multiple world-class instructors whom I hold in high regard. Jerry Wetzel owns Centerline Gym in Long Beach, California. Jerry holds multiple instructor certifications, including Elite Coach and former Vice President of Operations for the Crazy Monkey Program (an excellent version of western boxing designed for use in environments where weapons may be suddenly introduced), full instructor certification from Paul Vunak in Jeet Kune Do and Filipino martial arts, and is a black belt in Brazilian Jiu Jitsu under Chris Haueter. Jerry has developed the Red Zone Threat Management Program, which addresses the problems found in many martial arts systems that fail to acknowledge the difference between sport and self-defense, or teach techniques that are largely theoretical in application, possibly useless in the face of a real-world attack, and for the most part untested under pressure in situations in which both parties are going as hard as they can with the intent of not losing. 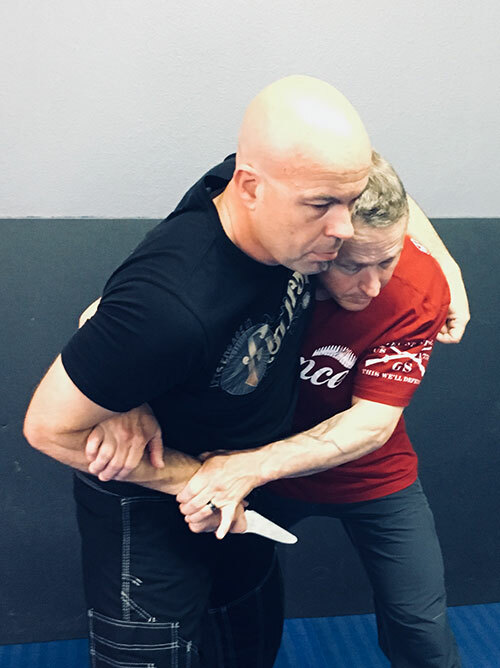 Hill Country Combatives owner and chief instructor Cliff Byerly (a certified Red Zone Knife Defense instructor) uses combination of Position, Pressure, and Angle to isolate and immobilize attacker’s weapon-bearing arm and set up his next move. This should be done prior to any attempt to break contact, throw attacker to the ground, or draw a handgun. • Aggressive forward pressure exerted by the attacker. • Attacker may launch multiple strikes from various and unpredictable angles using a powerful plunging and immediate re-chambering motion. • Victim may not be aware a knife was in play until they first felt it or even saw their own blood. • Incoming attacks most likely target the torso. • The attacker fights extremely hard to retain the knife and is not typically susceptible to disarms and wrist grabs. • Empty-hand skills are critical for survival, whether the target is carrying a handgun or not. Jerry describes the Red Zone Threat Management Knife Defense program as a closed-end system comprised of specific responses for specific scenarios. The techniques employed are simple, robust, and capable of being pressure-tested without serious risk of injury. In my opinion, they depend far more on the ability of the defender to first recognize an attack and then respond correctly through use of good technique and timing. If attacker bends his arm and seizes the defender (a common response), defender steps to attacker’s off-side and achieves second point of contact on attacker’s weapon-bearing arm. From this position, defender can take attacker to the ground via correctly executed knee bump, or break contact and achieve momentary distance. As I age, I find that the lyrics of the country and western song that say “I’m as good once as I ever was” no longer apply to my hand and foot speed, but over the years, through nothing but dogged training, my timing has actually improved. At the risk of being redundant, being aware is a critical part of the Red Zone Threat Management Knife Defense program. 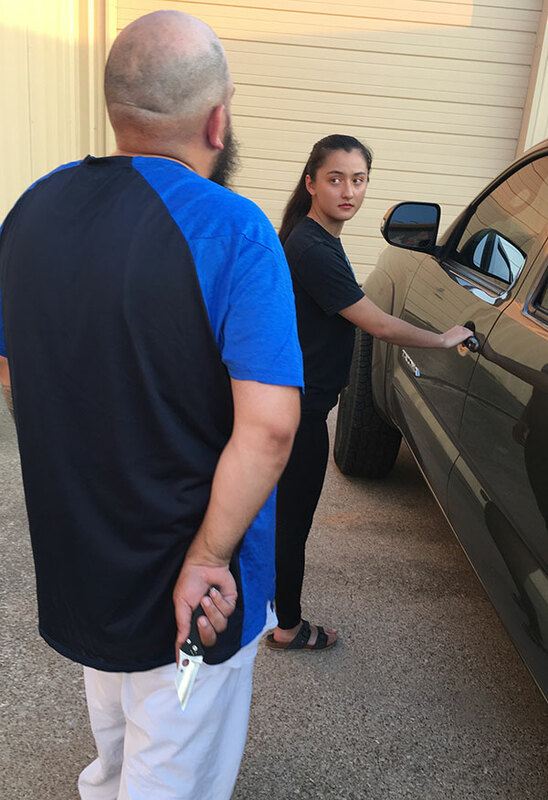 When dealing with a person or persons of questionable intent, watch their hands, look for postural shifts and flared elbows (frequently observed when a person attempts to access a concealed knife from their beltline or pocket). Now is the time to establish our own base, get our hands and feet in order, and perhaps initiate angular movement (as noted trainer Craig Douglas might say, “re-orient the battlefield”). • Achieve positional dominance by getting both hands on the weapon-bearing wrist. This is actually a natural reaction observed in multiple knife attacks. • Apply pressure so the attacker is unable to regain control of the weapon and employ it against us. • Maintain proper angle so as to maintain positional dominance. The attacker is highly unlikely to stand there under our control, and can be expected to move off at an angle where he can recover and resume the attack. • Use simple techniques to break contact and create sufficient distance to effectively get a handgun in play, or throw the attacker to the ground where he can be controlled. For the purposes of this article, we are going to focus on the former. 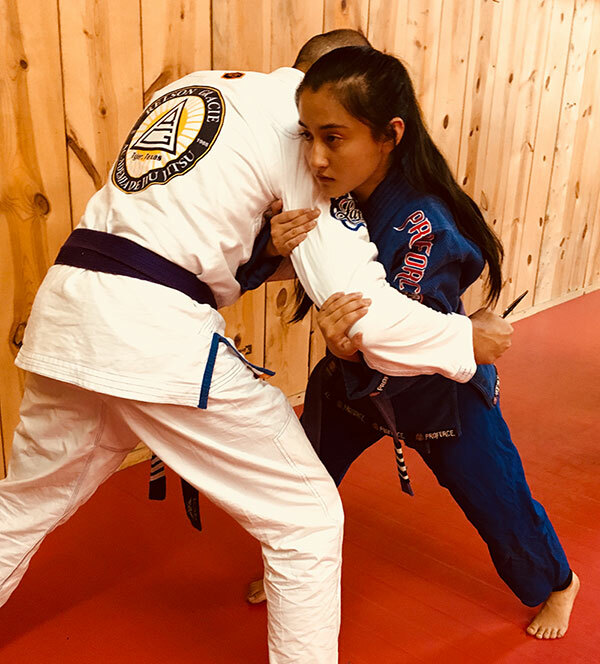 Tala Arthur, Judo Black Belt and Relson Gracie Jiu Jitsu 4-stripe purple belt, works through immediate-action drills with author. Tala has intercepted author’s lunge using Red Zone Dive-and-Drive technique prior to establishing two-handed grip known as the Handcuff on his wrist. The objective of the defender is to obtain control of the entire weapon-bearing arm by isolating it away from the attacker’s body and then immobilizing it by simultaneously applying pressure using the defender’s hands, shoulder, and even head to force the attacker’s weapon-bearing hand downward while driving the attacker backward. This action may be initiated by the “Dive and Drive,” a technique where the defender shoots both hands with palms touching between the arm and chest at armpit level and then gathers up the attacker’s arm between the elbow and deltoid. The natural reaction for the attacker is normally to resist, then do his best to retain the knife and get it back into play. When this occurs, the defender can carefully transition to an arm drag while stepping off the line of attack, effectively getting behind the attacker, and then quickly creating distance, drawing his handgun, and engaging as necessary. This might be an appropriate time to have a good handgun, holster, and gun-handling skills. It may take multiple rounds placed accurately to end the attack while continually moving off-line. Once contact is broken and distance achieved, defender can attempt to run away (not always an option), or draw his handgun more safely. However, the arm-drag technique may not be possible if the defender is not able to straighten out the attacker’s weapon-bearing arm and the attacker can use his free hand to grab and anchor the defender. 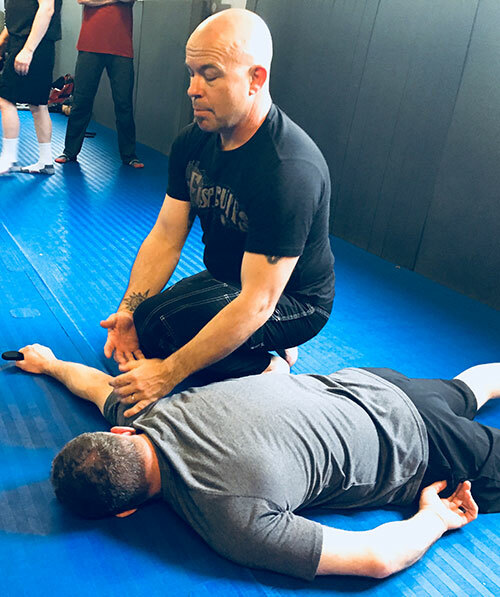 Jerry teaches his students to then use their arm opposite the attacker’s free hand to reach around the attacker’s body. The defender then circles to that side and establishes a secondary point of contact on the attacker’s weapon-bearing arm. I prefer grasping the top of the attacker’s forearm, but it may be necessary to grasp their tricep area instead if they are significantly larger. Once there, the defender can align his hips, “clutch” the defender’s knee between both knees, and place his head on the attacker’s chest. The defender then bumps the inside of the attacker’s knee forward while applying steady head pressure rearward in order to take the attacker to the ground. Like before, the defender then quickly creates distance, draws their handgun, and engages as necessary. WHAT IF YOU DON’T HAVE A HANDGUN ON YOU? This topic is covered in great detail in Jerry Wetzel’s book Red Zone Knife Defense. While I can’t recommend this book enough, I caution the reader that it is no substitute for training under Jerry or one of his certified instructors. The difference between what looks right and what is right is significant. 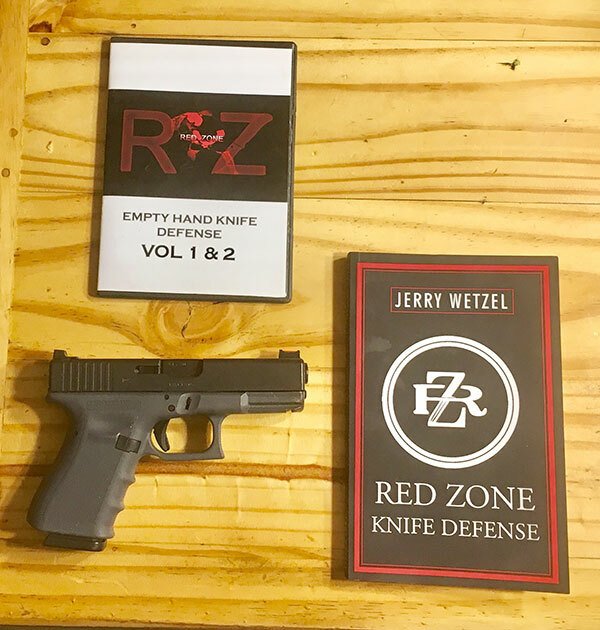 Red Zone Knife Defense DVD and book are a good place to start for those who are unable to immediately train under a Red Zone certified instructor. 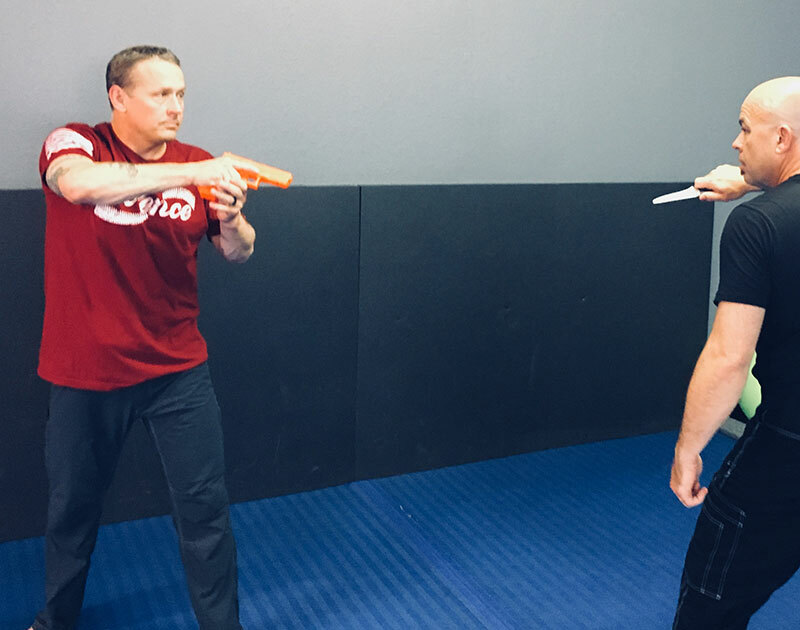 After taking the Red Zone Knife Defense instructor course several years ago, I recently convinced my business partner, Allan McBee, to take the Red Zone Threat Knife Defense course taught by Jerry. Allan has been both a student of and an instructor in defensive weapons and tactics for over 20 years, and I greatly respect his opinion. What stuck in my mind was his statement that, whenever he simply executed the nearly caveman-simple techniques properly, there was not even one time he would have received a significant stab or slash no matter how hard his partner tried. What are the chances we will use this training in our lifetime? For most of us, it is not statistically likely. I have also found it is entirely possible for a statistically unlikely event to have a disproportionately large negative effect on my life. Devoting minimal time to preparing for an event where the risk of severe bodily injury or death is significant is very doable for the majority of us. Steve Moses is a long-time defensive weapons and tactics instructor and Director of Training for Palisade Training Group, LLC. He is a reserve Texas peace officer, licensed Level 4 Personal Protection Officer Instructor, Relson Gracie Jiu Jitsu purple belt, and certified as a Red Zone Threat Management Knife Defense Instructor and Adaptive Striking Foundations Instructor.